I recently attended the Barbican Box regional showcase (20 June 2017) and had the opportunity to witness something so creatively individual and exciting! It was in an amazing venue – HOME in Manchester is a fantastic space. Four schools and colleges participated in the evening; two groups completing UAL qualifications from Macclesfield College and Carmel College, as well as a year 8 and year 10 group from local schools. Two Barbican Box artist mentors worked with the groups, either visiting the Centres for full-day workshops or via skype. “Students all start with the same stimuli and created very different work as part of the Regional Pilot. Common to all has been enthusiasm, wit, imagination and support for each other while learning to find ways of telling stories that deal with global issues. And, being young people, they bring positive energy and play to a subject that, right now, many adults are worn down by”. Michelle Mahoney, course tutor at Carmel College took the very brave step to use the box as a starting point for Unit 12, and wow, was it powerful! 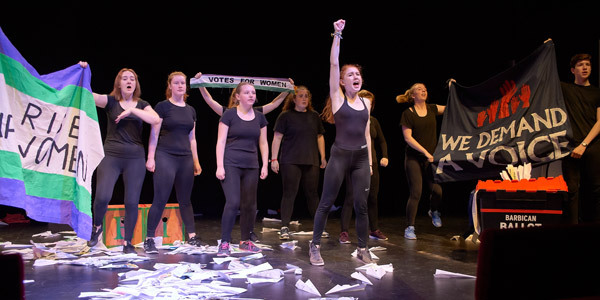 At Macclesfield College, it was introduced as part of an extra-curricular opportunity, which was equally challenging, creating work that was above and beyond the already-packed Level 3 Performing and Production Arts curriculum. The students performances were incredibly personal – at times, I got goosebumps, at others my eyes were filling up – a sign indeed that these students can touch hearts and minds. A special mention for Carmel College, their interpretation of the contents of the Barbican Box was for their Unit 12 final project, which had been translated incredibly well for a stage and audience very different to the ones they were accustomed to. The project also provided the opportunity for individuality, varied performance styles and genres, which is incredibly important for these students’ development and progression. They did an amazing job reconfiguring the piece to suit both final project and public performance. Barbican Box supports students and their teachers to create original theatre, music or visual arts from scratch. The programme comprises of a beautifully designed ‘Box’ of inspirational objects, curated by different world-class artists every year, along with six months of support including teacher training, mentoring from artists who deliver workshops, and tickets to performances to help inspire creativity. This regional Box was curated by leading theatre company, Complicite. If you are interested in finding out more about the Barbican Box project please contact creative.learning@barbican.org.uk and visit barbican.org.uk/learning to find out about the Barbican’s work with schools and colleges.